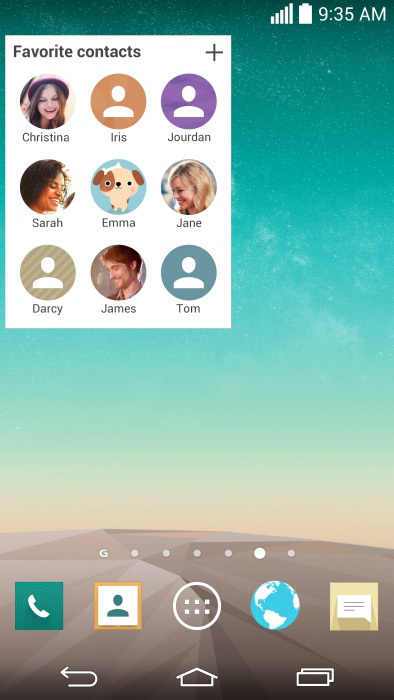 We saw what appeared to be the new UI that's going to be featured on LG's upcoming LG G3 flagship smartphone. And now it looks like a photo of the back of the handset itself was revealed by GSMarena. Unfortunately, said photo embedded on the left is heavily altered, and only shows the back of a white G3. The rear of the handset matches the design of these protective cases that are purportedly made for the G3. We can see a rear camera with a Flash on its right side, and a a mysterious sensor on the left. Below the camera there's a set of buttons similar, and yet different from what we can see on the LG G2, or on the G Pro 2. 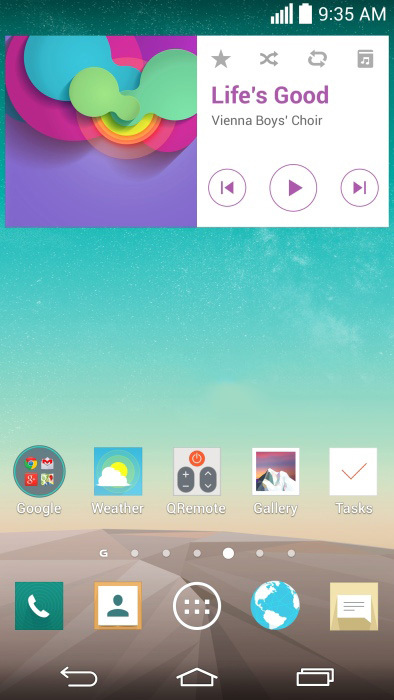 Today, we got some New Screenshots of the upcoming LG G3 with latest Optimus UI user interface on KitKat. 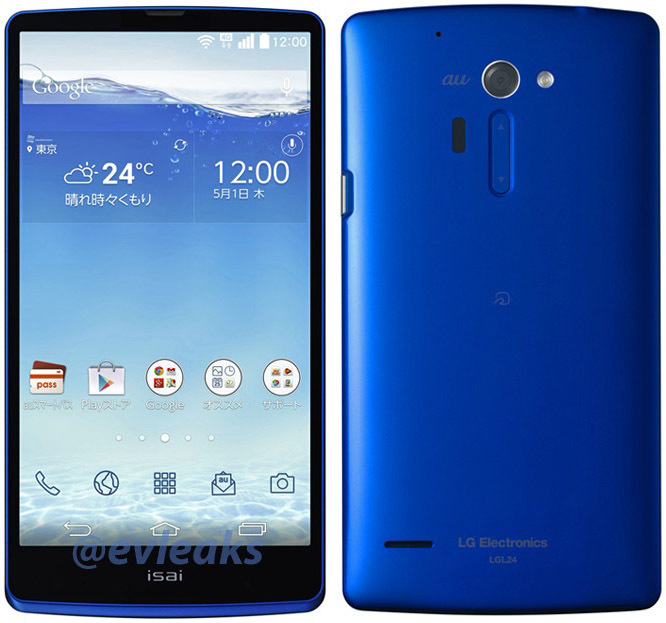 The screenshots shows a New flat design and confirms the QHD display resolution 2560x1440 pixels. These screenshots were leaked from a credible industry source. The title "You may want to take an umbrella since rain is expected during this afternoon" on the first screenshot (above) is in fact a New feature, which combines the weather forecast with your habits to provide you with a personalized recommendations for your daily routine. The overall look and feel of the latest Optimus UI (on top of Android 4.4 KitKat) is very clean and flat, a trend that a lot of manufacturers are embracing. 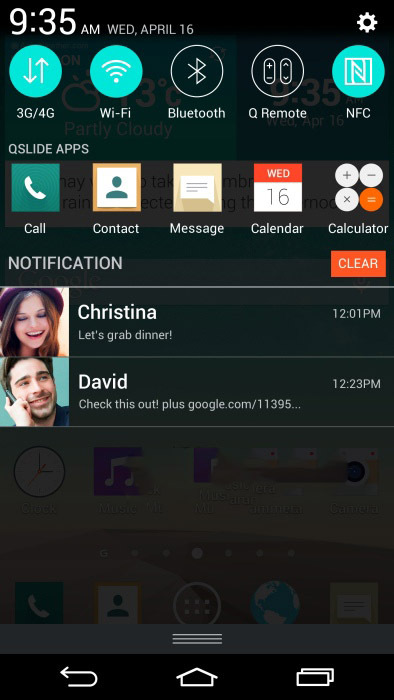 Everything from the icons, launcher and notification drawer is less cluttered and looks very nice. 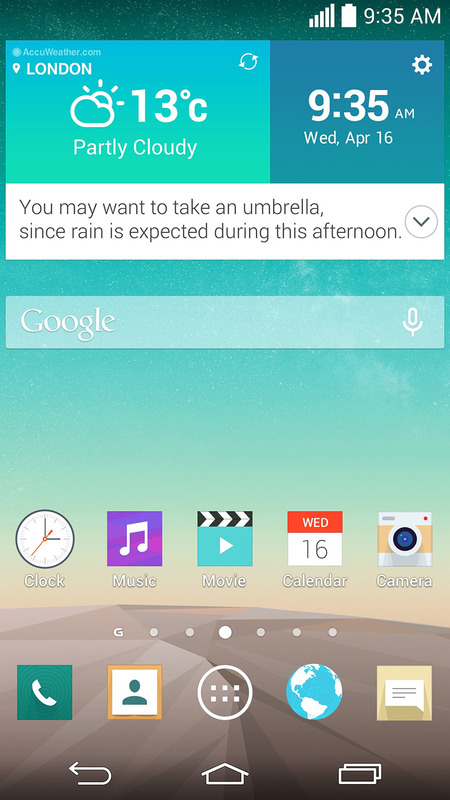 The quick settings toggles are rounded icons, similarly to the latest Samsung TouchWiz UI on the Galaxy S5. The position of the QSlide Apps remains unchanged, but still, the notification drawer seems too busy for our taste. The LG G3 is expected on June. Stay tuned! 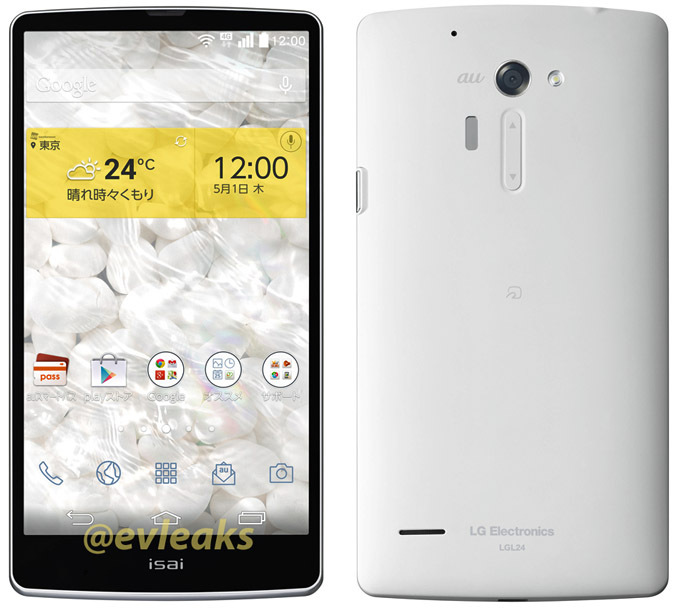 We already have all the LG G3 Specifications leaked which confirms it will pack a QHD display. Today, we've got an even more exiting News... A Photo of the Upcoming G3 Retail Box leaked. 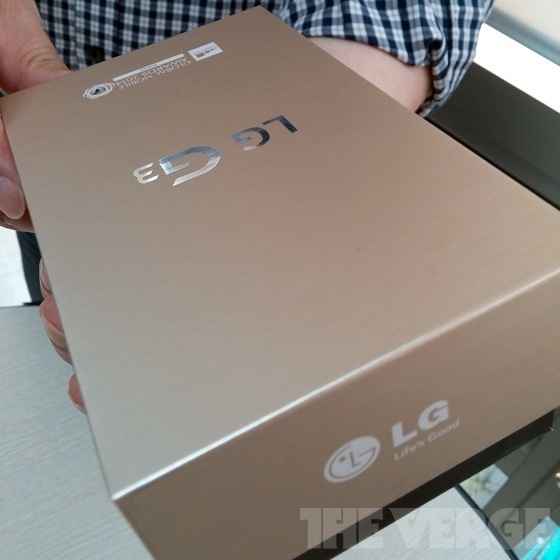 the photo shows a Golden box with LG G3 logo on it which confirms there is a Gold Version of the G3 coming very soon. Like Samsung, HTC and Apple, LG is going to release a Gold version of its upcoming flagship, fashionable color options is invading the smartphones market since last year. The only unconfirmed information about the LG G3 is its weight and thickness. LG will launch the G3 on an event in on 17,May but the date is not yet confirmed. We cannot conclude very much about the LG G3 from this photo, but we're definitely looking at a large display (though less than 6-inches), surrounded by bezels that seem just slightly thicker than the LG G2's famously thin side frames. 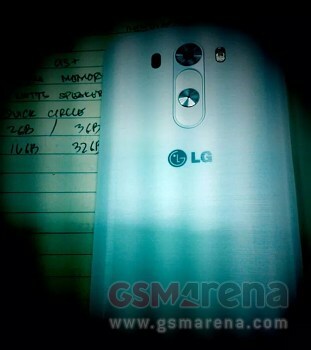 To compensate, the top bezel is heavily reduced, lets wait and see what future leaks will bring us. 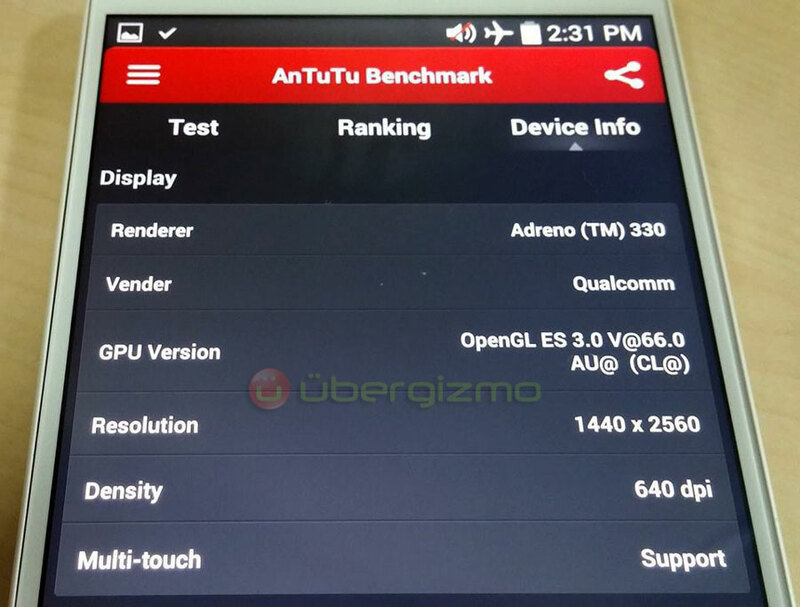 We already know that the upcoming flagship LG G3 will be coming with a QHD Display, Snapdragon 801 CPU along with Adreno 330 GPU. Today, we got the first live photo of the LG G3 device itself in white color but it only reveals a small part of the G3's front panel. The LG G3 rumored specs so far, which also include 3 GB RAM LPDDR3, and a 13 MP camera with OIS+ technology. We've come to expect a 5.5" display from the handset, with the said 1440x2560 pixels of resolution, which returns 538ppi pixel density this will be the highest ever announced on a brand name flagship.